I love all the flavours of Christmas – dried fruit, spices of nutmeg, cinnamon, cloves and ginger, nuts, marzipan, icing. You name it and I'll be licking my lips at the thought of it once 1st December comes round. Christmas is of course a great time for cake lovers but not everyone likes the traditional rich, dark fruit cake (I do of course!). 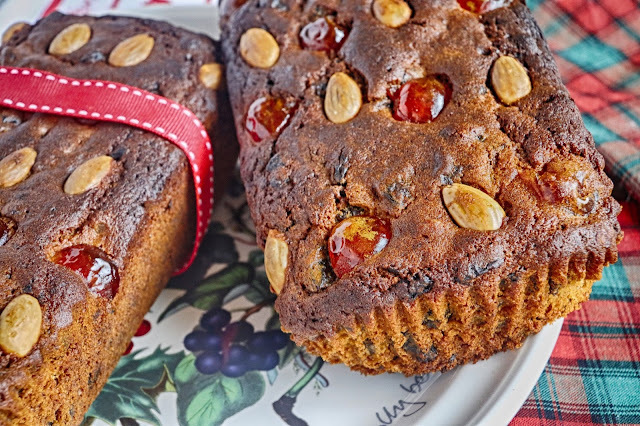 If you're wanting a lighter fruit cake with all the flavours of Christmas but none of the time and hassle of cooking a full-on rich fruit cake then this is one for you. The method really is as simple as putting it all in one bowl and mixing together. The added bonus is that is makes two loaf cakes which can be cooked together. I've used glacé cherries and blanched almonds on top but choose what combination you like. You could go for all cherries or all almonds or a mixture of nuts such as Brazil or pecans. They also freeze well which makes that great if you are wanting to building up stocks for Christmas fairs or need a cake when you are busy but have guests coming round. Mixture of whole blanched almonds and glacé cherries, halved – I used 22 almonds and 9 cherries for the decoration on mine. 2. Put all the ingredients except for the almonds and cherries in a large bowl and together with an electric whisk until it is all mixed together. 3. Spoon into the prepared loaf tins and level the tops. 4. Arrange the almonds and cherries on top. 5. Bake for around 1 hour until a skewer comes out clean. 6. Leave the cakes for a few minutes to cool and then turn out onto a wire rack to cool completely. Love the idea of an easy to make Christmas Cake. I do prefer a lighter fruit cake and baking it in loaf tins will make slicing a piece much easier.